With Medley, more fun music! KaiserTone Medley is a medley specialized player who can experience fun music time. This player is considerated for high function and high sound quality, to ordinary CD sound source and also high resolution sound source. ※It is for the music files that are stored in the iPhone/iPad/iPod Touch. 1. Listen as a medley of songs. This player plays the selected songs as a medley. At this time, the previous song and the next song will play comfortably with crossfade. Cross fading occurs only when the sample frequency, and channel number of consecutive songs are the same, and fade out when it is different. 2. Equipped with a sound engine that also supports high resolution sound source. This Sound Engine (with Equalizer) has been focused mainly on developed its sound quality. The engine is very fast to pursue a high-quality sound with the frequency of more than 64000. 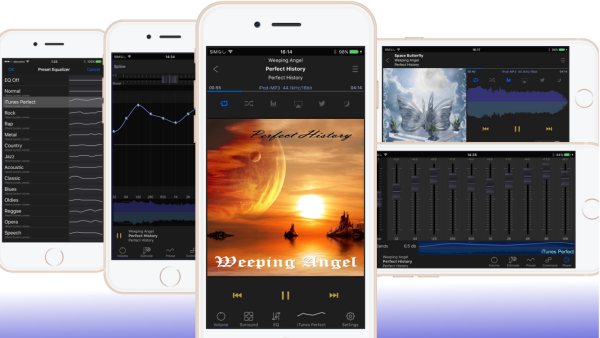 This engine performs equalizer, virtual surround, cross fader, and reproduces your favorite songs with your favorite high-quality sound. support for playback of hi-res sound source of maximum 768kHz/32bit. support for playback of high resolution sound source of maximum 12MHz/1bit for DSD format. output: The high resolution sound source is downsampled to a maximum of 96 kHz / 32 bits or less. The full performance at Dual Core CPU. Furthermore, 64-bit high-precision arithmetic processing is carried out in iOS models equipped with 64 bit-CPU. 3. Enjoy good design of operability. KaiserTone Medley has a cool design and good operability. 4. Enjoy the many features. KaiserTone Medley has many features. It has various functions such as adjustment of sound quality / volume, selection of music selection, screen setting. Please enjoy it with rock, pop, classical and jazz and all other music. 5. As a trial version of KaiserTone (paid version). KaiserTone Medley can be confirmed as a trial version of KaiserTone (paid version). Therefore, some functions will display "This function works only for paid version" message. These functions are limited only to functions as more regular players. * It is for the music files that are stored in the iPhone. * It might not to play a song which is DRM protected music. (1) A music data downloaded from Apple Music is DRM-protected data and can not be played. (2) However, On iOS 10 or later, as Extra function(For checking sound source data), DRM-protected music data can be cooperative played back with the restriction function by Music app. * It might not to play a compression dff file. ■ In iOS10 or later, at the time of the first start-up, alert of "“Kaiser Medley” Would Like to Access Apple Music And Your Media Library" is displayed. Go to the Apple Settings app, Scroll down and Tap the Kaiser Medley, Enable Media Library toggle. Adjusted the main volume and gain values. Improved continuous playback function during Apple Music cooperation playback. Adjustment of mini-player on selection screen. Improve NowPlaying list (queue) function. Added "add to queue" function by long press in all lists such as artist, album, playlist, ... .
Added a "mini player" to the selection screen. display ON / OFF function included. For non-iPad, it can be displayed only for portrait view. Added function to add to queue on songs list by long tap. Added "make as a Playlist" function from NowPlaying list. Added "Edit queue order" function. Added total time display of playlist and NowPlaying list. Added iPad Pro(3G, 11 inch) as compatible models. Adjustment of further link of Apple Music Playlist linked with Music. Added iPhoneXR as compatible models. Added function to change sound quality attribute (Aggressive and Legato) while using equalizer. It was more speeded up playlists lists display. Accessibility support for grid display of music selection view. Added attribute (Aggressive and Legato) change function to EQmode. Added iPhoneXS, iPhoneXS Max as compatible models. Further improvement of cooperative continuous playback of data specific to "music" application. Improvement of sound quality and function by "Updated Sound engine". Added left-right stereo / monaural control function (track output mode). Added the function to convert the input sound of left and right stereo (normal stereo sound) to left-right stereo(normal) / right-left stereo / monaural / Vocal Reducer and output it. It can be changed from the volume screen of the player screen / graphic equalizer screen. Increased the category acquisition item of the m4a format file in the high resolution DB. Enhanced cooperative playback function with Music app of "Music app specific data (DRM, iCloud, Apple Music)". Optimized sound quality and efficiency of sound engine when connecting device. Optimized the volume after changing the left and right volume balance while playing a monaural sound source. To the same name (title, album, artists etc) on the music selection screen, Adjusted the search method for with or without "The". Adjusted the display position in the list of music selection screens after iOS 11. Further efficiency improvement of high resolution sound quality calculation processing. Added "OverDrive" option to the Dynamic Limiter function. Added cooperative playback function with 'Music' app. On iOS 11 and later, Supported a function to add a music file to "HiRes DB" of this app from "Files" app by "Sharing" function. The setting view of "Settings -> General" was divided into two setting views "Setting -> General" and "Setting -> Details of Selection Song View". On iOS 10 and later, In the "Settings -> Details of Selection Song View", items for "Music app exclusive data" were added. On iOS 10 and later, "DRM (Digital Copyrights Management) data and iCloud data" can be displayed / hidden in the list of iPod library. iOS 11 or later, expanded the manual submission function to Twitter, facebook, Mail. Automatic posting function is abolished. Added iPhone 8 Plus and iPhone 8 as compatible models. Added option function to change output buffer length. Improved sound quality of crossfade part during crossfade playback. Further speed up starting display of list screen of music selection screen. Added option that does not use "Sample Rates, Formats" DB of iPod library. Response improvement of graphic equalizer's slider bar. Supported the dedicated tag of famous lyrics input application which sets non-standard tag as lyrics data of FLAC format. Response improvement of high resolution DB list check. Partial changed of display method of volume screen on iPhone 7 Plus. Adjusted the display position when changing the screen orientation vertically and horizontally on the music selection screen with grid display.